Two days ago, the IronPigs shuffled up to Rochester to begin a crucial stretch of 13 games which will likely determine their fate for the 2016 International League regular season. They headed into Frontier Field on Friday as the hottest team in the league, having gone 9-1 over their last 10 games. Of course, they lost then Friday night behind a satisfactory effort from newly inserted starter Phil Klein and a dearth of hitting. 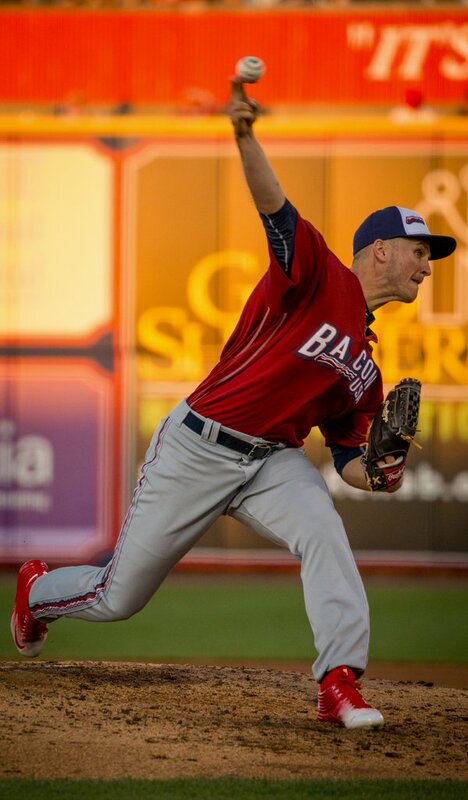 Last night they got one back as they made a 3-run second inning stand up for a 3-0 win as David Buchanan continues to get stronger as the season wears on. Darin Ruf had a solo HR, Darnell Sweeney an RBI single, and Jesse Valentin with a sac RBI as well as his first AAA hit in the game. 13 Games. 14 Days. 7 with first-place Scranton and 6 with third-place Rochester. When it’s all said and done, we’ll have a much better idea where this team may end up on Labor Day. As the MLB non-waiver trade deadline looms tomorrow, changes could befall all of these three teams vying for two playoff spots–the Wild Card will most certainly come from this division. For the Yankees affiliate, we’ve seen their top pitcher Luis Severino get called to the big club, and their top hitting prospect Aaron Judge on the shelf with a knee injury–and they’ve kept winning regardless. Judge may be able to return in the next week or two, and would likely remain with the RailRiders at least through the last couple weeks of August, if not all the way through the playoffs. The Yankees have been flipping relief pitchers, though, and reports have them receiving some top-prospects who could be used to bolster their AAA-playoff hopes, including Indians OF Clint Frazier. Basement-dwellers Minnesota, Rochester’s parent club, have intimated that their top pitcher from Rochester, Jose Berrios, will get called up tomorrow. While the RedWings have a largely-veteran lineup, the Twins don’t seem like they’re going to gut AA-Chattanooga–also chasing a playoff spot–to fortify Rochester. While things may change, I haven’t heard Minnesota mentioned in any big trades that would impact the RedWings, either. As for the IronPigs, we will indeed have to wait and see. If the Phillies trade a starting pitcher, it has long been assumed that young Jake Thompson would get the call to the Majors. However, with David Buchanan’s recent stellar outings, that may be somewhat in question. While a Hellickson trade makes all the sense in the world, I don’t think it’s a given. Jeremy is reportedly happy with Philadelphia, and could remain through the rest of the season and receive a qualifying offer. At that point, he could remain with the Phillies through another season or net the team an early-round draft pick. For the IronPigs, I doubt we’ll lose both Thompson and Buchanan barring something drastic or an injury. Nick Pivetta will likely stay with Reading, but the veteran Vasquez could return if we need a starter. The lefty Garcia continues to throw well in Clearwater and could help Reading. The outfield in Philadelphia is a bit crowded, and will be come more-so when Peter Bourjos returns from his shoulder injury in another week or two. Nick Williams is likely ready, but is still working on the details of his game and trying to make sure he’s not giving at-bats away for free. I don’t think they’re in any particular hurry to move him up unless he’s needed. I really don’t see the “bash brothers” from Reading moving up without an injury or other drastic situation. That killer lineup–likely getting even better when Roman Quinn returns this week–will remain intact if my read on the situation is correct. So with all those moving parts and if’s and but’s we’ve still got a 2/3 chance to make the playoffs if you want to over-simplify. Yes, I’ve been known to joke around about such things, but I don’t think it’s too early to start looking ahead and “saving the dates” just in case. If the standings remain “as is” and the IronPigs get the Wild Card spot, they’ll face the RailRiders in the first round, hosting games one and two of the best-of-five, on Wednesday September 7 and Thursday September 8. The division winner would get the “weekend” series, starting on Friday September 9 and continuing on Saturday and Sunday if necessary. The Sunday game would be 5:35PM if the IronPigs overtake the RailRiders and win the division. Meanwhile, in Reading, the juggernaut has but a 4-game lead over suddenly red-hot Trenton for their division. Should they hang on and win, they’ll get the weekend series 9/9-9/11 as above, and vice-versa with a second place finish as with the IronPigs above. For southeastern PA baseball fans hungry for playoff baseball, it’s advantageous for the IronPigs and Fightins to finish either 1-2 or 2-1 in their division races so that fans can attend all games. For the following week, should both teams advance, it appears that the coordination has already been built in: The IronPigs (or Scranton, North or Wild Card) is already set to host the first two games of the Governor’s Cup finals on Tuesday September 13 and Wednesday September 14. Meanwhile, the Eastern League Championship series is already set to have the Eastern Division champion host the final three games (if necessary) from Thursday September 15 through Saturday the 17. Oh, one other footnote. It looks unlikely, but if Hartford is involved in the AA playoffs, their games would all be played in Reading because they have no stadium. I’m counting on the IronPigs’ well-seasoned broadcaster to steer this team to the IL Post-Season on the strength of sheer will power … LET’S GO PLAYOFFS!! !